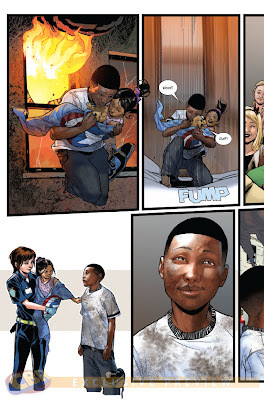 Miles Morales commits his first act of heroism! Ganke rushes over to Miles' house where Miles shows him his wallcrawling. To better understand the origins of Miles' powers, Ganke suggests that since Miles got bitten at his Uncle Aaron's apartment they should return there and ask him about it. However when they get there the next day they discover that Uncle Aaron has moved out. Leaving the apartment, Miles and Ganke notice a burning building with people trapped inside. With a little encouragement from Ganke, Miles uses his powers to rescue the civilians. He then runs into an alley and tries to process what he just did. He tells Ganke that he just wants to live a normal life; after all, New York already has a Spider-Man (this story takes place after Ultimatum but before The Death of Spider-Man). Miles and Ganke attend their first day at Brooklyn Visions Academy where they room together along with another guy named Judge. One night all the kids in the school get called into the gymnasium for an emergency drill due to the events of Ultimate Comics Avengers vs. New Ultimates. One of the teachers informs the students that Spider-Man has been shot. 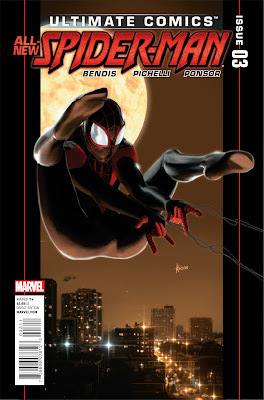 Brian Michael Bendis and Sara Pichelli continue to tell a compelling origin story for this new Spider-Man. The highlight of the issue was definitely Miles rescuing the civilians from the burning building. The look Pichelli gives Miles after he rescues a little girl is pure gold. Even though this series is coming out bi-weekly, I can hardly wait for the next issue. Spidey fans owe it to themselves to check this out! Spider-Man Reviews features as many updates on the latest developments in Spider-Man comics as we can, along with reviews, commentary, news and discussion. Occasionally we try to throw in some game reviews as well. We're in no way related to Marvel, but do recommend you read their comics. Drop a comment anywhere you like on the blog, or join the discussion board. Enjoy! All rights reserved : Marvel 2011 Monezine Blogger Templates Designed By Jinsona Design | Blogger XML Coded By CahayaBiru.com . .